WATCH: Blind Filipina sings out Mariah Carey hit "I'll Be There"
Home » Alienette Coldfire » Bling Singer » Katchry Jewel Golbin » Mariah Carey » News » Video » Viral Video » WATCH: Blind Filipina sings out Mariah Carey hit "I'll Be There"
Another singing sensation is having it's round through out the internet today. 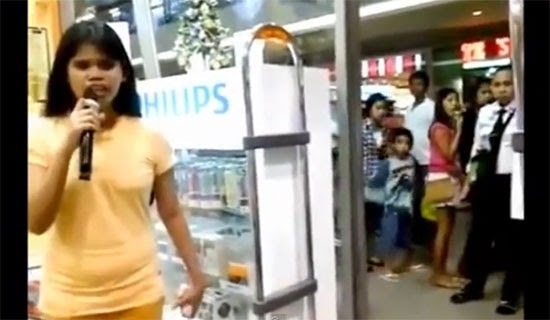 The young blind girl who sung one of Mariah Carey's hit song from the 90's caught everones attention in a mall. The girl who was tagged as Katchry Jewel Golbin and also know as "Alienette Coldfire" in some social media site as Facebook, has gained 2,603 Followers including me, as of writing this post. Youtube user Jeff Alagar who posted the video describe the posted clip as, We had to look twice as the video started because it was so good I thought she was lip syncing. But this is all genuine vocals coming from this little gem." Let's watch the amazing blind Filipina Girl sings like Mariah Carey! Well I do understand him, 'cause if you really have listen to this girl's voice you'll know how beautiful she sings. I even get this goosebumps all over my body. Comments or suggestions about "WATCH: Blind Filipina sings out Mariah Carey hit "I'll Be There"" is important to us, you may share it by using the comment box below.